My son battles with stress-induced anxiety. When under pressure, he becomes hyper-sensitive. Everything is enhanced and he will become very aware of any ache, pain, or sound to the point of maddening distraction. He is on sensory overload. He becomes agitated, begins to shut down, and cannot see reason. He also avoids, at all costs, that which is causing him the stress. It literally slams on the brakes of his life and our family. In exasperation I have talked, I have pleaded, and I have yelled. (I am not proud.) I have prayed over him, prayed for him, and prayed with him. Yesterday we found ourselves in the middle of one of his firestorms and I finally looked at him and asked that one simple question…What are you holding on to? He is reaching out for help with one hand but the other hand refuses to let go of the frustration and agitation. Have you ever found yourself in a pit like that and it seems that no matter how much you climb and struggle you only get deeper? What are you holding on to? It is only dragging you back down, slowing your progress. God is not going to pry it out of your hand. You must open your hand and let it go. Stop fighting. Stop struggling. 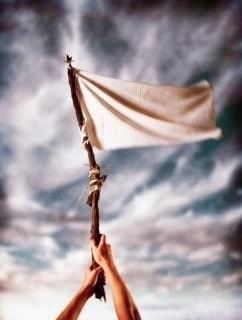 Wave the white flag. Release the death grip of control. Surrender. The actual act of surrendering is the easiest thing you will ever have to do. Getting to the place where you are ready to surrender may, in fact, be the hardest. Your victory comes through surrender. Father, you know what is on my heart today. You know what I have my fingers clamped around, what I am unable or unwilling to let go of. You know what my heart is holding hostage. Please change my heart Lord. Help me to loosen my grip and let go. Help me to forgive, to move on, and most importantly open my eyes so that I can see the freedom that surrender brings through your salvation. Through You Lord, and only through You, I know that I can claim victory. Lord, save me!